NOW AVAILABLE AS AN E BOOK! Janis Walker is the author of Alleluia! A Gospel Diary and several other books. She has a Master's degree in Theology from St. Patrick's Seminary and also studied at Fuller Theological Seminary and at the Graduate Theological Union in Berkeley. She is a card-carrying member of the Betsy-Tacy Society! Janis was received into the Roman Catholic Church in a Chrism Mass for Christian Unity on May 13, 1998, in Rossi Chapel, at the Jesuit Retreat Center in Los Altos. She lives with her family in California and has a continuing interest in the ecclesial effects of the Oxford Movement and the legacy of Cardinal Newman. Book size is 6 by 9 by 0.3 inches thick, 126 pages, printed on high quality cremé paper with 12 point Minion Pro typeface. 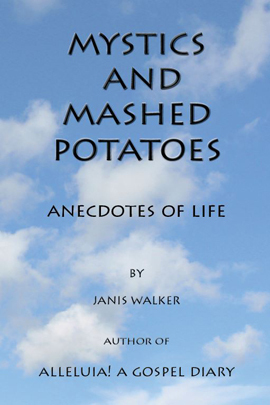 E BOOK ORDERS ON SMASHWORDS: --> ONLY $0.99!